Yesterday, I told you about Hiring Job Hoppers: The 10 Reasons They Are So Very Valuable. 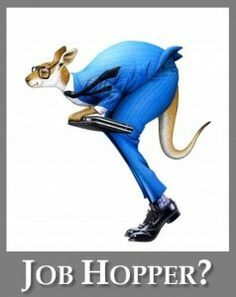 Today I’m tackling the other side of the issue — how to keep the job hoppers you have hired from hopping again and finding a job somewhere else. Rather than assuming that their early departure pattern will continue, you need to develop a plan of action to keep “job jumpers” and “job hoppers” in your organization as long as you want them. Proactively act so that a job jumper will stay – Jumpers left in the past because they are not treated as they expected to be treated. However, just because others have lost them doesn’t mean that you must also lose them. You can break that cycle by making sure that they have a great manager (a primary cause of turnover) and by also identifying and applying their individual motivators. You must also identify their “frustrators” (why they quit their previous jobs) and work to avoid letting them happen again. Simply increase the volume of two-way feedback with them and focus your retention process on them. And finally, if you ask them for their “dream job criteria” and you can meet them, you will find that they may never leave again. Job jumping is not inevitable; the pattern can be stopped with proactive and targeted motivation, communications, and retention action. A job hopper may be at the end of their wanderlust – Don’t assume that an individual’s job jumping will go on forever. After a series of jumps, the odds are that former jumpers now know what they want and don’t want in a job, manager and company.” Your job is to work with them as an employee so that they feel that they have finally found their home. Learn to take immediate advantage of all short-duration talent – The very best firms have learned how to effectively manage a variety of short-duration talent. We have learned how to get the most out of temps, contractors, consultants, and seasonal help. So we should do the same with job jumpers who may become short duration talent. Start by assuming that they might leave early, so proactively capture their ideas and best practices. Also assign them a buddy or mentee who can absorb their wisdom and experience. Obviously it may not make sense to put them into longer-term assignments like leadership development or extensive training unless you have taken proactive retention actions to ensure that they will be around to complete it. During down economic times, high layoff rates, and the fact that many individuals were forced to take temporary or part-time jobs, resulted in many individual switching jobs more frequently. For example, one high-tech manager who I know loved his job and company, but the minute that they froze his operating budget for a year he left immediately. He simply wasn’t willing to take a year off from innovation, experimenting, rapid learning, and being on the leading edge of his field. In his case, blame the budget cut not any wanderlust on his part. With the growth of LinkedIn, referral programs, and social media, you don’t have to be actively looking for a job in order to be approached by a top recruiter or headhunter. This means that many job jumpers don’t choose to look for a new job, but instead they are found and approached by recruiters because they have extensive contacts, advanced skills, or that their work is visible online. By the way, consider the fact that if they would have turned down an exciting growth opportunity and stayed, they probably would’ve ended up being frustrated and not very productive (a lose-lose situation for both parties). The tenure of the average employee at a firm is 4.6 years, so almost everyone these days is a job jumper. One of the reasons that employees quit more often these days is that it’s so easy to find and apply for a new job. Jobs are “pushed” to them and with the click of a button they can apply for a job using their current LinkedIn profile. Employee tenure is going down in part because it’s simply so easy to leave. Managers became lazy or even arrogant because their employees had few choices but to tolerate them. So after years of suffering, it’s not surprising that as economic conditions improved, the best employees quickly moved on. I wouldn’t automatically blame the ambitious job jumper for moving on, because the blame has to be shared with poor retention efforts. You want ambitious employees with initiative, so you can’t blame them for moving when an outside firm clearly valued them more than their current manager who was unwilling to match a clearly superior opportunity. Many of the best technology employees are simply in love with new technologies. If their current firm clearly isn’t investing in cutting-edge technology, you shouldn’t blame these techies for leaving to a firm that has leading-edge technologies. So before rejecting a techie for job jumping, see if they left for technology driven reasons. Being loyal and willing to work on antiquated technology may not be a 100 percent positive trait, even for your current employees. Incidentally, when considering hiring job jumpers, take a second look at the employees who have “jumped” from your own firm. Recruiting back top performers who have left (they are called boomerangs) can be an effective recruiting strategy. Leading firms (Deloitte and DaVita are two that excel in this area) have learned to welcome them back with open arms because, like most job jumpers, they now have additional external experience and skills. In addition, many managers view the return of top performers as a kind of reinforcement that they (the firm and the culture) are excellent, because people with “multiple choices” chose to come back! In the Silicon Valley where I work, moving between firms (jumping or hopping) is seen by managers as a positive thing, because it gives an individual a chance to learn in a variety of environments. Having a wide variety of experiences (we call it diversity) is viewed as lessening the chances that an employee will take a “too narrow view” of their job and where the industry is going. Unfortunately, I find that HR professionals in the rest of the world are among the strongest resistors when it comes to hiring job jumpers. But there is no data to suggest that the best stay longest and that those who jump are bad hires. In fact the opposite may be true: The best move often because they get multiple offers and they can. In most cases that I have researched, job jumpers actually wanted to stay but they couldn’t, because their managers or HR lacked the courage to match the learning and growth opportunities that were readily available at firms … across the street. So the final lesson to be learned is that your best employees will likely soon become a job hopper unless you move proactively to make sure that their next “best “opportunity” offer comes from inside your firm! And if you can’t keep every top employee forever, don’t worry, your job is to simply get the most out of them during the time they spend with your organization.